Self-lubricating Bearing is the best bush / sleeve for high performance and long life. The graphite bearing mark is also characterized by the quiet running. The oil contained in the porosity provides a constant lubrication between bearing and shaft, so the system does not need any additional external lubricant. Self-lubrication allows this type of sliding bearing to work under hydrodynamic conditions, resulting in a very low friction coefficient. The constant oil presence eliminates the risk of seizure, and allows the bearing to work during thousands of hours without wear. Professional manufacturing process. Being a well-renowned entity, we are engaged in providing a distinguished range of Self-lubricating Bearing. Moreover, our product is available at cost effective prices. 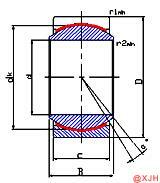 4) Features of structure: Without oil groove and oil holes, with an axial split in outer race. With dual seals. Sticked with a piece of PTFE fabric on inner surface of outer race. 5) Properties: Self-lubricated, low friction, good wearability, corrosion resistance, self-alignment, dust proof.